Sophisticated and elegant, the SPA of the hotel is an area where you will come to discover a new balance of mind and body thanks to its thermal swimming pools with whirlpool baths, aroma-chromatic showers, vascular journeys and fitness activities in beneficial waters. Our sources, our natural mud is the best nature provides for treatment and prevention of all pathologies affecting the skeletal system such as primary and secondary arthritis, extra-articular rheumatisms and dysmetabolic rheumatisms. Thermal baths are an effective natural remedy for a large number of skin disorders. The latest scientific research confirms the appropriateness of thermal treatments mostly for: psoriasis; acne vulgaris, eczema, allergic dermatitis, and pityriasis versicolor. Finally, even those not affected by a specific disorder will benefit from a beauty remedy to increase the skin's elasticity, beauty, and overall health. We cure and prevent inflammatory pathologies of the primary respiratory tracts and the middle ear through breathing treatments through vaporizers, humages, Politzer treatments, endo-tympanic insufflations, nasal showers, micronized showers and audiometric testing to study hear capacity. You will be assisted by specialized staff for the entire duration of your treatments. The most frequent pathologies are: simple and vasomotory rhinitis; rhinosinusitis; chronic pharyngitis; chronic faringotonsillitis: chronic laryngitis; otitis media purulenta chronica; secretive otitis media; catarrh otitis media; tubal stenosis; rhinogenic deafness. This includes the treatment of peripheral vascular pathologies, such as primitive varicose veins, secondary varicose veins induced by postphlebitic syndrome. Treatment consists of ozonized thermal baths and whirlpool baths in warm and cold tubs for the vascular system. Our water has been labeled "prodigious" for treatment of conditions of female genital track, such as vulvovaginitis, cervicitis, and persistent leukhorreas. Treatment consists of vaginal irrigations and balneotherapy in thermal tubs. The sources of the springs at Capasso gush out at 47° centigrade, and they are thermal water chemically classified as bicarbonate-alkaline mineral sulphuric water. Thanks to the richness of mineralization and the degree of radioactivity, this water is unique throughout Italy: it has been proven effective in the treatment of arthro-rheumatic pathologies and used for treatments of skin care, the respiratory system, the ear, nose and throat, and the feminine system. The 4 swimming pools of the center are distributed over various levels, each fed by a source of sulphuric water, varying in composition and temperature, ranging from 29° to 60° Celsius. So, in the winter time, you can immerse yourself into the warm swimming pool fed by the Fonte Ercole source or into the wide waterfalls of Fonte Venere, where you will enjoy a unique experience. Cosmetic product for external use. Contains thermal water from "Terme Capasso." * Cosmetic adjuvant for treatment of skin flaws caused by cellulite. Instructions: Twice a day, apply an abundant amount of product onto the treatment area, massaging with circular hand movement until the product is completely absorbed. Continuous use for at least four weeks is recommended. We recommend repeating treatment cycles throughout the year. Cosmetic product for external use. Contains thermal water from "Terme Capasso". Instructions: Apply on face and neck twice a day. Cosmetic product for external use. Contains thermal water from "Terme Capasso". Instructions: Apply twice a day on perfectly clean skin. Cosmetic product for external use. 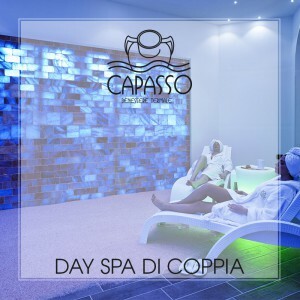 Contains thermal water from "Terme Capasso." Instructions: Apply every day over the entire body, massaging until product is completely absorbed. Also useful as after-shower and after-sun moisturizer. Cosmetic product for external use. Contains thermal water from "Terme Capasso". Instructions: Apply an abundant amount of product over the treatment area. Wait about 20 minutes. Rinse with abundant lukewarm water.